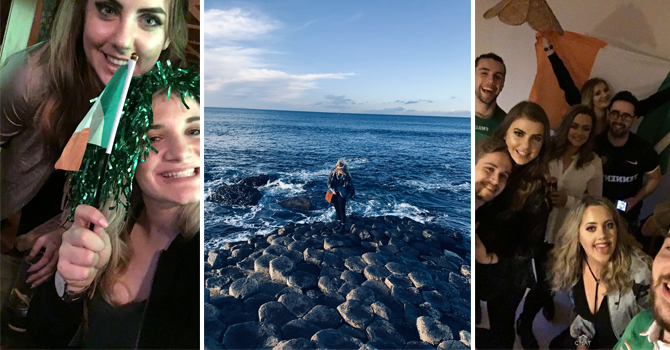 Lena Sperger, a Griffith College student and our Austrian ambassador, provides some tips for settling into a new country. By the age of 24, I had already lived in three different countries and I can tell you that it wasn’t always easy at the start. Leaving behind your comfort zone; family, friends and all you know, to start an adventure is not something everybody is capable of doing. However, moving to the Netherlands for my study exchange and Ireland for my master’s degree were two of the best decisions I have ever made. I ended up living in the Netherlands and Ireland by chance, and people often ask “how were you not scared?” and “why did you move somewhere where you didn’t know anyone?” or “Why this country?” to which I would answer: “I am a restless person.” I am always on the move, ready to explore something new. I hope this blog will help you have the best time possible when you move to another country. we all have our friends back home so making new friends from scratch can be daunting, but I promise you it will pay off in the end. The friends we make while living abroad are completely different from our childhood friends; it’s a different form of friendship but one that it will last a lifetime. There is no shame whatsoever in seeking the familiar when you first arrive in the new country — We are all creatures of habit and it doesn’t make you antisocial to want friends from a similar background as yourself. We especially need it as it’s very easy to start missing home and crave familiarity when you’re living abroad. However, don’t put all your eggs in one basket and try to leave your comfort zone. You won’t be the only one feeling insecure and frightened! Keep an open mind and expand your horizon — be open to other cultures and friendships, worship the differences and find similarities in the contrast. It will not only help you grow as a person, but the things you’ll learn can’t be taught in college. A lot of study programs offer a wide range of school events, sports clubs and societies. Have a look and join the ones that you are interested in. There will be lunches, dinners and getaways for students organised by the Students’ Union or other organisations. Have a look at the posters in the cafeteria and around campus and take advantage of those events. There will be a lot of other students in the same position as you. Also, plan group activities after class; go to the museum, take a drawing class together, volunteer or learn something new. If in doubt, go online to the likes of Facebook. There are hundreds of location-based groups of all kinds. To be comfortable with others, you have to be comfortable with yourself first. Wander around your new town by yourself, watch people, go to the cinema or read a book in the park. You don’t have to excommunicate yourself, but settling into a different culture is way easier if you are comfortable with being on your own as well. Surround yourself with strangers and engage with them; ask them about what their story is and you might be surprised by what they tell you. Who knows, you might meet a friend in a restaurant where you grab dinner every so often or meet a friendly café owner. Also, put your phone away! Unplug and slow down. Being on your phone and looking at all the stuff that’s going on back home doesn’t help you find new friends and no one wants to spend time with someone who is always on their phone. There are tons of other possibilities to meet new friends, but most importantly, be yourself and take risks. Studying abroad can be equally nerve-wracking as it is exciting. Enjoy the time you have to explore the new culture, meet new people and expand your horizons. It is a once-in-a-lifetime experience.